The ability to detect and emit ultrasonic frequencies -- those above the human hearing range -- is an essential survival tool for many animals. Certain nocturnal and marine species rely on sensitive ultrasonic systems for navigation and prey detection, while some insects use ultrasonic hearing to detect and evade predators. Ultrasonic communication is important to many animals in a variety of settings. Many bat species, as well as dolphins and other toothed whales, navigate and hunt by ultrasonic echolocation, a process achieved through the projection and reception of high-frequency pulses. The variation and delay between the returning sound waves enables the animal to form a long-range mental map of its surroundings. In bats, the ultrasonic system consists of the larynx, the nose, mouth and ears, while the dolphin’s system involves the nasal passages; the melon, which is a fatty organ situated on the dolphin’s forehead; and the jaw bones and inner ears. Researchers have concluded that adult male house mice emit ultrasonic vocalizations to attract females, and that these ultrasonic courtship "songs" play a role in the female’s choice of mate. A recent study by Research Associate Kerstin Musolf (et al., 2010) at the University of Zurich suggests that these vocalizations may help prevent incestuous breeding, as wild-derived female mice seem to be attracted to courtship vocalizations of non-kin over those of their male siblings. Nocturnal flying insects are at risk from predatory bats, but the pressure-sensitive auditory systems of several species of insects, such as moths, katydids and lacewings, allow them to detect a bat's ultrasonic echolocation sonar. Once a pulse and its intensity is detected, risk level is assessed, and the insect will launch into appropriate evasive flight. Some bat species use echolocation at a lower frequency than moths can detect, but the tiger moth has gone one step further, emitting ultrasonic clicks that startle the bat and jam its sonar function. 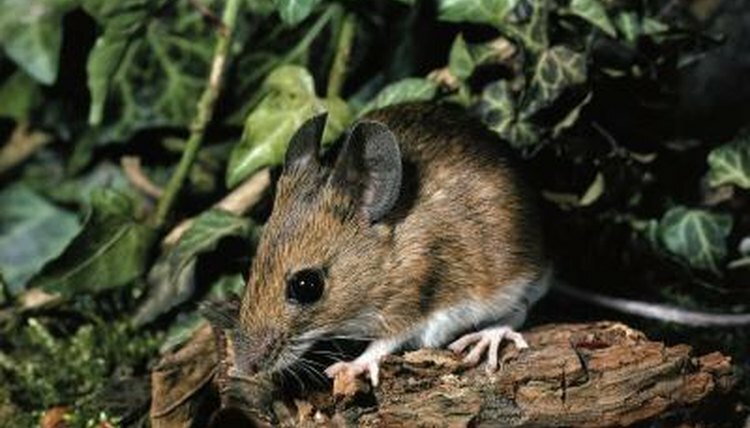 Rats, mice and other rodents can communicate with other members of their species through ultrasonic vocalizations, limiting their chance of detection by certain predators. The melodic calls of the concave-eared torrent frog and the rufous-faced warbler also contain ultrasonic elements. Researchers suspect that these particular species have developed this communication component in part as a result of living near noisy, turbulent streams. Ultrasonic components have also been detected in the blue-throated hummingbird and the New Zealand rifleman, a small, wren-like bird so-named because the green of the male’s plumage reminded New Zealand settlers of an infantry rifleman’s uniform coat. U.S. National Library of Medicine - Ultrasonic communication in concave-eared torrent frogs (Amolops tormotus). Gisele LeBlanc has been a writer and editor since 2005, with a focus on children's publishing. She has contributed to “Wee Ones” magazine, “KidVisions” magazine and “Vision: A Resource for Writers.” LeBlanc also created and managed Berry Blue Haiku, an online haiku magazine for children.